Born in 1970, Anke Neuman was enthusiastic about all forms of nature from an early age. Anke grew up studying drawing and the fine arts, in the former industrial city Karl-Max- Stadt (now Chemnitz) and this has influenced her sense of the technical. Anke's training as a skilled worker in textiles technology and spinning (1986-1989), in addition to various internships at art and crafts establishments in Berlin, created the basis for the subsequent study of the surface, and textile design at the art academy Weissensee (1998-2003). 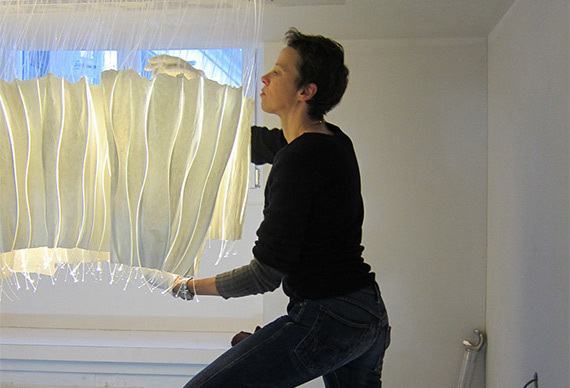 A series of experiments in paper making inspired Anke to undertake practical training, and provide assistance in the paper workshop Gangolf Ulbricht, Berlin. The ability to produce large format papers gave inspiration to interior surface installations. The idea to bring light into paper resulted in incandescent lamps between two paper layers. A wider exploration of light-conducting materials and sources of light brought fibre-optics. LICHTPAPIER arose in connection with her diploma (2003).